1994 dapple grey (black) stallion. Photo show Halter Champion. Bloodlines to Rolling Hills Leonet and Ichabod Ricinus. 1995 bay stallion. RARE color in Percherons! Live show Champion, Sire of Live show Champions. Multi time champion Halter and Harness performance stallion. YEA winner, OFCC Bronze medallion winner. Bloodlines include Blackhome Duke, Glynlea Raven, Master Flame and Lucasia Sir William. Bred by Lake Hill Ranch. 2005 bay roan Percheron Stallion. Unshown, nice pedigree tracing to Glynleas Silver laet, Pennwoods Fashions Spiderman and Swordpoint Oops. Bred by Fantisy Farm. 1988 Grey (black base) Mare. 2004 NAN Top Ten! lovely bloodlines! OPEN: 94, 95, 96, 97, 98, 99, 01, 02, 03, 05, 06, 07, 08, 09, 10, 11, 12, 13, 14, Pensioned, No foals after 2014. 1988 grey (black base) mare. Unshown, bloodlines to Lucasia Mr Black and Justamere Showtime. Bred by Heidi Reaves. OPEN: 93, 94, 95, 96, 97, 98, 99, 02, 03, 04, 05, 06, 07, 09, 10, 11, 12, 13, 14, Pensioned, No foals after 2014. 1988 grey (black base) Mare. Limited showing with good results. Excellent pedigree tracing to Morden Chief 2x, and La don Degas. Bred by Samantha Kroese/VnV. OPEN: 93, 94, 95, 98, 99, 00, 01, 02, 03, 04, 05, 06, 07, 09, 10, 11, 12, 13, 14, Pensioned, No foals after 2014. 1990 grey (black base) mare. NAN qualified halter mare, Live show performance champion. Open years: 95, 96, 97, 98, 99, 01, 02, 03, 04, 05, 06, 07, 08, 09, 10, 11, 12, 13, 14, 15, Pensioned, No foals after 2015. 1990 Grey (homozygous) Mare. Unshown, blending of real and model lines tracing to Wayfair Defensor <model> and Lucasia Sir William <real> Bred by October Moon. OPEN: 95, 96, 97, 98, 99, 00, 01, 02, 03, 04, 05, 06, 07, 08, 09, 10, 11, 12, 14, 15 Pensioned, No foals after 2015. 1992 grey (homozygous) Mare. Currently unshown, lovely bloodlines including Blackhome Duke, High Vire Dragano and College Lynda. Bred by VnV Stables. 1992 grey (black base) Mare. Unshown, with a mostly real pedigree. Bloodlines trace to Lucasia and Laet breeding. Bred by Heidi Reaves. 1995 grey (black base) Mare. Live show winner, Dam of a live show winner. Nice blend of model and real parents, tracing to Restless Knight, Mordecai and Laet breeding. Bred by Dragon Star Farm. 2000 bay mare. Unshown, rare coloration in Percherons! Bloodlines include Blackhome Jason, DID and Glynlea Raven. Bred by Double Hart Ranch/Cory Hartung. 2003 grey Percheron mare. Multi champion halter mare, live show winner. Pedigree tracing to Blachhome Grandeur Lyn and Blackhome Duke. Bred by Double D Ranch/Barbara Daily. 2006 black Percheron mare. Unshown, bloodlines tracing to Blackhome Jason and Glynlea Raven. Bred by Foxfire and Randa Garrett/Twin Springs Stables. 2011 bay Percheron mare. Live show winner. Bloodlines to Blackhome Duke and Glynlea Raven. Real Time bred Foxfire foal so has a permanent foal body. 2011 bay Percheron Mare. Live show placed, bloodlines to Blackhome Duke, Glynlea Raven, and Ichabod Ricinus. Real Time bred Foxfire foal so has a permanent foal body. 1989 grey (black base) shire Stallion. Unshown,m nice bloodlines tracing to Stanley House Black Prince and Ladbrook Invader. Bred by Thundervalley Farm. 1992 grey (black base) stallion. Will begin showing soon. Bloodlines to Hainton Warrant and Lymm Sovereign. Bred by Heidi Reaves. 1993 grey (black base) Shire stallion. Live show winner, currently unshown in photo shows. Mostly live pedigree tracing to Ryton Majestic, Elton Lad and Grangewood breeding. Bred by Heidi Reaves. 1997 bay stallion. Excellent show record, Many times Champion/Grand champion. Bloodlines tracing to Grayingham Lucky Lad, Ruskington King William and Stanley House Black Prince. Bred by Erin Logan/Red Wold Ranch. 1998 black sabino stallion. Good halter stallion, excellent bloodlines tracing to Ladbrook Courage and Stanley House Black Prince. Bred by Persimmon Hill. 2001 chestnut stallion. Excellent show horse, RARE color for Shire horses! Bloodlines to Dothan Mastermind and Ladbrook Invader. 2008 black stallion. Unshown, bloodlines tracing to Jim's cheiftain, Hainton Jim and Raygold Bill. Bred b y Foxfire and Kay Myers/Caballos Del Mar. 2009 grey Stallion. Unshown, bloodlines tracing to Ichabod Ricinus, Grayingham Lucky Lad and Rolling Acres Leonet. Bred by Foxfire and Kay Myers/Caballos Del Mar. Open years: 99, 05, 06, 07, 09, 10, 11, 12, 13, 14 Pensioned, No foals after 2014. 1991 black sabino Shire mare. Unshown, Nice model bred pedigree. Bred by Green Mountain/Heather Mays. 1993 Palomino Shire Mare. RARE COLOR in shires, but documented authentic. Many times Champion, Grand Champion halter mare. Dam of champion halter horses. Bloodlines trace to Ladbrook Invader and Ryton Majestic. Bred by Cory Hartung/Double Hart Ranch. 1994 golden bay Shire Mare. Unshown, nice model bloodlines tracing to SLM Hawk Supreme and Soldier Of War. Bred by Rocket City Stables. 1995 grey Shire mare. Two time 2015 MIJC National Champion. Multi Champion/Grand champion in halter. Bloodlines tracing to Grove Battlemaster, Rhyd-Y-Groes Premier King and Jims Chieftain. Bred by Kay Myers/Caballos Del Mar. 1996 grey (homozygous) Shire mare. Unshown, Sire model bred, dam tracing to real bloodlines including Grangewood William, Ruskington King William and Crossfields Supreme. Bred by Randa Garrett. 1998 grey Shire Mare. Limited showing. Homebred mare with lines tracing to Alneland Masterpiece and Hainton Jim. 2005 grey Shire Mare. Many time champion/Grand Champion halter mare. Preigree traces to Garreg William and Bogernog Ambassador. Bred by Lisa Burgard/Horseshoe Crest Ranch. 1989 bay sabino Clydesdale stallion. Excellent model bred pedigree. Bred by Thunder Glen Ranch. 1996 bay sabino Clydesdale stallion. Live Show winner, Many times champion Halter stallion. Champion Sire. Pedigree is primarily model bred, with live crosses to the Bardrill and Doura lines. Bred by Green Mountain Stables/Heather Mays. 1996 bay sabino Clydesdale Stallion. Limited showing with good results. Pedigree traces to Blue Print Glen Argyll, Dakota Blue and Ridgedale Prince. Bred by Eileen O'Dell/Painted Pony Ranch. 2000 bay sabino Clydesdale Stallion. Limited show career, pedigree traces to Ayton Suprem (2x) and Teddy Footprint. Bred by Randa Garrett/Twin Springs Stables. 2000 bay sabino Clydesdale Stallion. Unshown, bloodlines to Lloyds Donnie and Weidmans Command Scotty. Bred b y Cory Hartung/Double Hart Ranch. 1989 Bay Sabino mare. Lovely, classy mare and a very nice show mare! Open years: 94, 95, 96, 97, 98, 99, 03, 04, 05, 06, 07, 08, 09, 11, 13, 14 Pensioned, No foals after 2014. 1995 chestnut mare. Unshown, great bloodlines including Baron Scotty, Ridgetime Prince and Blue Print Glen Argyll. Bred by Painted Pony Ranch. 1996 bay sabino Clydesdale Mare. Unshown, nice bloodlines including Ridgedale Prince, Broadlea Classic Joe and Glencoe Sandy. Bred by Thunder Valley Farm. 1999 bay sabino mare. Currently unshown, bloodlines to Dillars Benedictine, Ogdensburg Shamrock and Solomon's Chief. Bred by Cory Hartung/Double Hart Ranch. 2000 bay sabino Clydesdale mare. Unshown, bloodlines to Belleau Viceroy and Greendykes Lucky Shot. Bred by Cory Hartung/Double Hart Ranch. 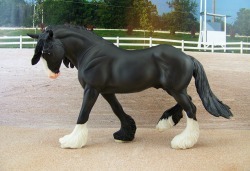 2002 black sabino Clydesdale Mare. Unshown, bloodlines to Hillgrove William and Conqueror. Bred by Kay Myers/Caballos Del Mar. 2004 baby sabino Clydesdale Mare. Multi Champion Halter mare, pedigree traces to Doura Gael Force,Doura Magnificent and Dunsyre Silver King. Bred by Cindi Makagawa/Indigo Creek. 2010 bay sabino Clydesdale mare. Limited showing, LSP. Bloodlines to Teddy Footprint, Broadlea Classic Joe and Doura breeding. Real time bred Foxfire Foal, so has a permanent foal body. 2011 bay sabino Clydesdale mare. Good show mare, breeding to Ridgedale Prince, and blue Print Glen Argyll. . Real time bred Foxfire Foal, so has a permanent foal body. 1988 chestnut tobiano NASD Stallion. Unshown, pedigree is a blend of model and real breeding. ½ Shire, ¼ Clydesdale, ¼ Paint. Feathered. Bred by Cory Hartung/Double Hart Ranch. 1999 palomino sabino NASD stallion. Champion halter stallion, bloodlines to Doura Major, Ladbrook Invader 2x and Ryton Majestic. Feathered. Bred by Cindi Nakagawa. 2000 black tobiano NASD Stallion. Bloodlines to Legend, Radalta King and Oaklands Marc. Primarily Clydesdale, Belgian and Paint breeding. Feathered. Bred by Cory Hartung/Double Hart Ranch. 1990 bay tobiano NASD mare. Live show placed, photo show winner. Breeding is mostly Shire and Paint. Clean Legged. Bred by Samantha Kroese/VnV Stables. OPEN: 96, 98, 99, 00, 02, 04, 05, 06, 07, 08, 09, 10, 11, 12, 13, 14, 15 Pensioned, No foals after 2015. 1992 black tobiano Mare. Unshown, bloodlines include Clydeslea Millisle Venture and Bulbridge Traveller. Feathered. Bred by Thunder Valley Farm. 1993 bay tobiano NASD mare. Unshown, nice blend of model and real bloodlines. ½ Paint, ¼ Clydesdale, ¼ Belgian. Clean legged. Bred by Cory Hartung/Double Hart Ranch. 1994 blue roan tobiano mare. ¼ Shire, ¼ Clydesdale, ¼ Belgian and ¼ pinto American Warmblood. Unshown, nice bloodlines tracing to RKD Traci and Rincinus Concar Chief. Feathered. 1999 Black Splash NASD Mare. 7/8 Percheron, 1/8 Paint. LSP, bloodlines tracing to DID, Sawmill Acres Commander and Catch the Knight. Bred by Laurel Dedes. 2001 bay tobinao NASD Mare. Unshown. Paint/Belgian/Percheron breeding. 2002 bay tobiano NASD Mare. Unshown. 1/2 Paint, 1/4 Clydesdale, 1/4 Percheron. Good blend of working stock horse and classic draft lines. Clean Legged. Bred by Kay Myers/Caballos Del Mar. 2003 grulla tobiano NASD Mare. Multi Champion halter mare, Grand champion. Feathered legs. Sire is a Percheron/QH cross, dam is 3/4 Shire, 1/4 Paint. Bred by Cory Hartung/Double Hart Ranch and Cindi Nakagawa/Indigo Creek. 2004 chestnut tobiano NASD Mare. Excellent show mare, Bloodlines to Farceur and DID breeding. Clean legged. Bred by Indigo Creek/Cindi Nakagawa. 2006 red roan sabino NASD Mare. Unshown, bloodlines tracing to doura major, Ladbrook Invader and Jubilee Chief. 2009 black tobiano NASD Mare. Unshown, nice pedigree tracing to MG's Prince, Pecos CJ and Farbig Buddy. Bred by Rocking G Ranch. 2009 bay tobiano NASD Mare. Live show winner, photo show champion. Percheron/Irish Hunter/Paint bloodlines. 2010 palomino tobiano NASD Mare. Many times Champion, YEA winner. Nice bloodlines tracing to Ladbrook shire lines. Real time Foxfire bred foal so has a permanent foal body. 1991 blond sorrel Belgian Stallion. Unshown--great bloodlines tracing to Masters Eddie and Congolaise. Bred by VnV Stables. 1993 Blond Sorrel Belgian Stallion. Unshown, excellent model bred pedigree. Bred by Persimmon Hill. 1994 chestnut Belgian Stallion. Live show Champion and Overall Grand Champion! Pedigree is a blend of model bred and real, tracing to Beltain Coronet, Colonel K Farceur and Tony Farceur. Bred by Persimmon Hill. 1998 bay roan Belgian Brabant Stallion. Currently unshown, pedigree traces to Duc and Karl van de Vierstraat. Bred by Double Hart Ranch/Cory Hartung. 2000 bay roan Belgian stallion. Unshown, blend of American Belgian and Brabant lines. Bred by Jean Sorensen. 2002 bay roan Belgian Brabant Stallion. LSW, bloodlines tracing to Eros Van’t Berrekenshof and Isadore can den Hagelberg. Belgian Brabants can be bred to American Belgians for registerable Belgian foals. Bred by Laurel Dedes. 2007 chestnut stallion. Limited showing with good results, bloodlines to Cedaridge and Farceur breeding. 2010 chestnut stallion. Limited showing, nice placings. Bloodlines to Oaklands Marc and Granges Pete Farceur. Oakland's Marc, and Grange's Pete Farceur. 1987 blond sorrel Belgian Mare. Unshown, bloodlines tracing to Constrico and Terr-A-Way Elegant Du Marais. Bred by VnV Stables. 1990 blond sorrel Belgian Mare. Unshown, excellent model bred pedigree tracing to Bay-B 2 ton and Beltane Coronet. Bred by Thunder Glen Ranch. OPEN: 95, 96, 97, 98, 99, 00, 01, 02, 03, 04, 05, 06, 07, 08, 09, 10, 11, 12, 13, 14, 15, 16 Pensioned, No foals after 2016. 1990 chestnut Belgian Mare. Unshown, bloodlines tracing to Congolaise and Oaklands Marc. Bred by Jean Sorensen. 1991 blond chestnut mare. Unshown, nicely modelbred tracing to real lines. Bred by October Moon. 1993 blond sorrel Belgian Mare. Unshown. Bloodlines include Cedaridge Master Plan, Masters Eddie, count Cedric and Comrad K Farceur. Bred by Hidden Valley Stables. 1993 chestnut mare. Unshown, primarily model bloodlines tracing to Bay-Be 2 Ton, Rebel’s Dixie Lee and Bombasto. Bred by Rocking M Ranch. 1994 blond sorrel mare. Unshown, nice bloodlines including The Nobleman and Orndorffs Highland Premier. Bred by Rocket City Stables. 1994 blond sorrel Belgian Mare. Unshown, excellent real pedigree tracing to Radalta King and Conqueror Farceur. Bred by Persimmon Hill. 1999 red roan Belgian mare. Live show winner, real bloodlines tracing to Orndorffs Supreme U2 and Crills Jubilee Jim. Bred by Caballos del Mar. 2000 dark chestnut Belgian Mare. Good show mare, bloodlines to Oaklands Marc, Conte, Granges Pete Farceur and Marusen Barge. Bred by Randa Garrett/Twin Springs Stables. 2002 dapple golden chestnut Belgian mare. Unshown, nice bloodlines. Some Belgian Brabant blood, Dorus van't Driesveld, Greentop Centennial and Remlap Spike. Bred by Cory Hartung/Double Hart Ranch. 2002 chestnut Belgian mare. Unshown, bloodlines tracing to Marquis D'Astria, All-en-Time Jayson and Constrico. Bred by Trish Yanko/Rivendale. 2007 chestnut Belgian mare. Limited showing. Pedigree traces to Oaklands Marc, Jay Lou Supreme and Con du Marais. Bred by Double D Ranch. 2004 black leopard stallion. Currently unshown. 96.8% draft (mostly shire breeding). Bloodlines to Dothan Mastermind, Dyfed Grey Prince and Metheringham Stormer. Bred by Nancy Baker/Fantisy Farm.